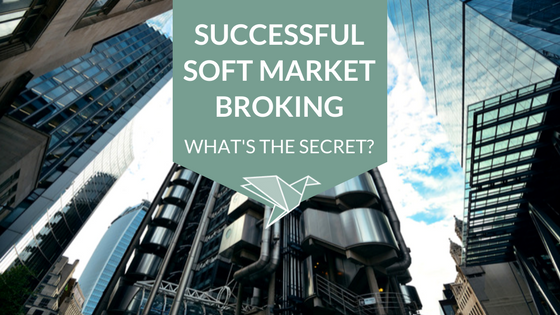 The Progress Partnership – Successful soft market broking – what’s the secret? The Progress Partnership / Business / Successful soft market broking – what’s the secret? What effect does a soft market have on brokers, and their skills? With insurers seemingly desperate to maintain and grow gross written premium levels, do brokers still need to be able to, well, broke? The answer is yes with a capital Y. In 1996 I launched my career broking international property and energy business. At that time, as a newcomer, I was told that I was ‘lucky to be learning my trade in a soft market.’ Hmm …two decades later, following some ups and downs, that soft market has become almost marshmallow in consistency! Let’s state the obvious: everybody knows that rates are a function of capacity and that capacity is a function of losses. A period of lower than average catastrophe claims has coincided with record low interest rates, encouraging new capital into the market, increasing capacity. Veteran brokers are claiming that this is the toughest trading environment they’ve experienced. These high capacity levels, along with intense competition and greater pressure on brokerage and fees make it tough to achieve a decent margin. Add that to the ever increasing costs of compliance and regulation and season with the fact that with investment returns at a low, both clients and insurers are retaining more risk on their own balance sheets. It’s a recipe for potential problems. There’s no doubt it’s a tricky time to be a broker. We’re seeing the invasion of the facilities. From Aon’s “Client Treaty” to Willis Towers Watson’s 360 and the Marsh Berkshire Hathaway deal the number of risks available to be broker and underwritten on the “open market” is reducing. Brokers involved in this portfolio trading need to build or hone skills that have not historically been sought in the direct market; data analytics, modeling and actuarial capabilities are becoming ever more valuable alongside the ability to build high level relationships. In 2014 I was interviewed by Reactions magazine who were seeking expert opinion on the future of broking. I commented then that successful brokers also need to look after the risks that don’t fit well into the commoditised pot, and there are plenty of them. This means that innovative deal makers are needed and that, in turn, means traditional broking skills are at a premium – this is still true 24 months on. Given the nature of risks that do not fit the “facility” mould, and this competitive market, skills such as negotiation, communication, strong network and relationship building are now more important than ever. And that means if you are a broker, now is the time to build your skills! Very few people believe we will ever return to a true hard market (in the sense of a genuine lack of capacity to react to a single event). As a result, up-skilling has never been more important. From deal-making to strategic planning, brokers who fail to train and develop themselves and their teams will fail to harness the potential of a fast-moving but increasingly nebulous soft market. I’m currently working with both brokers and insurers who see this as an opportunity to get ahead so if you want to develop your skills, or those of your team, I can help. Contact me today to explore how market trends could give you the edge, rather than leading you to a sticky (marshmallowy) end.